Located in Denver’s Capitol Hill neighborhood, Warren Village was established in 1974 when citizens and business professionals saw an influx in the number of single parent families struggling to subsist. These community members wanted to build a program that would give these families a chance at economic independence. One of those community members was Dr. Myron Waddell, a physician who worked in Denver’s inner city during the 1960s. Along with others in the community, he conceived Warren Village after observing an increasing number of single parent families and accompanying high rates of poverty, family violence and homelessness. An active member of Warren United Methodist Church, Dr. Waddell envisioned an “intentional community” of single parent families who could live in a safe and decent temporary home while working toward self-sufficiency. Over a period of nearly ten years, Warren Church bought eight plots of land, razed the existing buildings, and donated the land for the creation of an urban village. Fast forward to today, 40 years later. Warren Village has continued their mission to provide single parent families in Denver with affordable housing, supportive family services, childcare and education. There is no doubt about the impact this organization has made on our local community. As a public business, Carmine’s is frequently approached by a variety of charities seeking financial support. Obviously, we cannot support each charity, but once we were introduced to Warren Village, we knew our contributions would go far. Warren Village certainly stands out with a 40-year history of community service to families in need of a hand up, not a hand out. The dedication of these single parents to improving their own lives and creating better futures for their children is truly inspiring. For that reason, we will host our second dinner for Warren Village on Tuesday, June 23, 2015. We find that hosting repeating dinners for a charity will often have a natural growth allowing us to offer more financial support. These special dinners also help to build community in support of a particular cause – in this case, poverty and homelessness. We hope you join us for a special evening to benefit the families who receive services through Warren Village. Learn more at www.warrenvillage.org. Throughout the history of fashion, the little black dress has become known as the essential staple in every woman’s closet. And when it comes to the Carmine’s menu, we have a staple of our own. So what is this dress-me-up, dress-me-down, night or day ingredient we can’t live without? The basil plant is one of the most widely known and grown herbs in the world. Often associated with Mediterranean cooking, basil is native to India, Asia and parts of Africa. As a member of the mint family, basil has antioxidant and antibacterial properties, and offers a healthy dose of vitamin K, vitamin A, manganese and magnesium. It’s no wonder we use it in so much of our cooking! One of our favorite basil-touting recipes at Carmine’s is homemade gnocchi. Served in roasted pomodora sauce with kalamata olives, we toss in torn basil to maximize the dish’s flavor. We also slide some basil in our seafood dishes and use it to enliven our Panzanella (bread salad). Basil is also the main ingredient in pesto – a mixture of basil, pine nuts and parmesan cheese. Pesto appears in many places on our menu, and even just a small amount can take a dish to the next level. Of course, we don’t limit our use of basil to food. Our new specialty cocktail, the Carmine’s Cooler, is a blend of Cruzan Light Rum, Tommasi Prosecco and fresh-squeezed lime, made perfectly refreshing thanks to muddled basil. This summer, we encourage you to discover new ways to use basil in your own cooking (or drinking!) at home. And the next time you come in to Carmine’s, we promise there will be plenty of basil to go around. Q: Carmine’s employees are known for their longevity at the restaurant. How many years have you worked at Carmine’s? A: Compared to everyone else, I’m a newbie! I started here June 2014, so I’m coming up on one year next month. Q: There are so many menu options at Carmine’s. If you had to pick a favorite, what would it be? A: Honestly, I think we make the most amazing cheesecake on the planet. 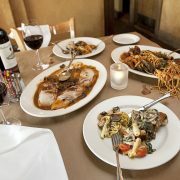 But aside from dessert, I’m a big fan of the Chicken Montana, Pasta alla Carmine’s, and Chicken or Veal alla Carmine’s. If you want veal, Carmine’s is the place to get it. Q: As a bartender, you can probably mix up a drink with your eyes closed. What is your favorite drink to make behind the bar? A: I pour an awesome glass of wine! Other than that, I really enjoy making an Old Fashioned. It’s such a classic drink and for some reason, it seems to taste better here at Carmine’s. Q: And what about your favorite drink to enjoy after hours? A: I’m all about the bourbon. Q: Carmine’s has a pretty extensive wine list. If it were in stock, which wine would you recommend to a customer? A: Try the Sor Ugo Cabernet Sauvignon-Merlot blend from the Aia Vecchio Winery in Tuscany. If you’re looking for a smooth red wine, this is the one. Q: Last question and probably the most important! Why do you love Carmine’s? A: First of all, I knew about Carmine’s before I even moved to Denver! I had heard wonderful things about their management, and it all turned out to be true. They take good care of us, don’t micromanage our work, and encourage us to be ourselves and let our personalities shine. Plus, it’s always nice to enjoy a free family-style meal with your coworkers after a long night. When we took over Carmine’s nearly ten years ago, I was surprised by the number of solicitations for donations we received. It was our standard practice at the time to give a gift certificate to just about anyone who asked. But I could see that this was not a sustainable practice and questioned the true value of these donations from a both a philanthropic and marketing perspective. Then the recession hit in 2008, really changing the financial realities for many people. Our business declined substantially as well. As the dust was settling, I realized that we were still in good shape and felt a need to support the local community in some way and to share our good fortune with others. My wife and I debated several ideas with a real focus on how we might “feed” people in need. This led me to the head of The Delores Project. She agreed to meet with me and hear our “brilliant” idea. I wanted to open the restaurant for one day a year and feed anyone for free. She politely told me this was not only a bad, potentially chaotic plan, but that this one day of helping would not spread very far. So our plan evolved. We chose to select as many charitable partners as we thought we could support and then design specific ways that we might help each one. Fast forward to today. We have used our restaurant space for special gatherings, catered events, and hosted dining evenings where substantial portions of the proceeds are directed to our partners. Each fall, we entertain presentations from organizations that ask for our support. We are naturally drawn to certain types of organizations. Specifically, we have worked with groups dedicated to homelessness, children and schools. We try to determine if our support will be important to the recipient either financially or in a way that helps to build up an organization. We want to evaluate each organization for their ability to deliver to those in need and use our donation wisely. This month, we are proud to support the work of two local organizations – Project Angel Heart and The Denver Waldorf School. On Tuesday, April 28, we are hosting a fundraising dinner for The Denver Waldorf School and will be donating at least 50% of the evening’s food sales to the school. My three children attended Waldorf Schools from preschool through high school, so l am acquainted with the wonderful work done by dedicated teachers in this system. Not only that, but The Denver Waldorf School moved back to our neighborhood in 2014 and is celebrating 40 years in Denver! We wish to support their continued growth and capacity to serve children. Then on Thursday, April 30, we are joining over 250 restaurants throughout Denver and Boulder to participate in Dining Out for Life to support Project Angel Heart – a nonprofit whose mission is to deliver nutritious meals to Coloradans with life-threatening illnesses. Save the date to dine out with us and we’ll donate 25% of the evening’s food sales to Project Angel Heart! We hope to see you soon, and thank you for your continued support. Does anyone age wine anymore? Once it was standard practice for a restaurant to purchase wine with the intention of aging before presenting to the consumer. But today, market pressures make this quite rare as the cost of inventory, space, and knowledge limit the opportunity. Here at Carmine’s, we strive to offer a simple, uncomplicated wine list composed of all Italian wines (which can be very confusing to consumers). We are committed to serving the finest wines we offer after some extended aging in an effort to show the true sense of Barolo, Barbaresco and Brunello di Montalcino wines, for example. Recently, we were offered the current vintage (vintage = the year the grapes are harvested) of these “big three” to add to our wine cellar. We tasted 2009, 2010 and 2011 vintages. We try to project development of these “young” wines so that they can be offered in a rotation with other purchased wine when they are more ready for the consumer. Some of these same wines are on our wine list today from the 2001, 2004 and 2006 vintage! We will try to save a couple of bottles from special vintages for those times when a consumer is really searching for something special. So we typically have a few bottles of quite special and more aged wines when requested. This category represents a small corner of our total wines sold, but it occupies a large portion of interest and intrigue as we get to follow these wines in their development. Last week, our well-traveled Assistant Manager Stephen hosted a Tour of Italy dinner and wine tasting based on his recent adventures in Italy. We had an amazing turnout, with a little over 20 guests filling up our back room to enjoy an evening of culinary indulgence! As the group enjoyed their first beverage – Borgo Magredo Prosecco – Stephen shared his international travel tips, including the best times to visit Italy. Going in the spring? Expect a bit of rain. Summer is typically busy, as it’s a popular vacation time. Love wine? Experience the fall harvest! And of course, you can’t pass up the skiing when you visit in winter. Stephen then moved on to explaining the geography of Italy, which is very important when considering the country is one of the most popular wine growing regions in the world, and the 4th largest producer. The various climates and soils of Italy allow for a wide variety of grapes to be grown. Tuscany has your Chianti. Find your favorite white wines in the northeast. And look out for Sicily! This area is up and coming in the wine world. All of this wine talk wouldn’t be complete without some Italian food, so guests were served Antipasti Carmine’s alan Rolatini along with samples of two white wines – Torre Rosazza Savignon and Umani Ronchi “Casal di Serra”. Stephen then moved on to serving House and Caesar salads, which were paired with a rose wine – Rivera Pungirosa, and a lighter red – Vignamaggio Chiati Classico. And for the main course? Bolognese, Pasta Carcio, Chicken Parmigiana and Veal Pazzo with two full-bodied red wines – Giacosa Fratelli Barbaresco and Michelle Castellani “Colli Christi”. Delizioso! Finally, the evening concluded with dessert and a sweet Moscato – Marenco “Pineto”. Lots of food, lots of wine. Now that’s what we call a Tour of Italy. Want to attend the next Tour of Italy? Stay tuned for future dates by following us on Facebook, Twitter and Instagram. And be sure to check our online calendar for more upcoming events! ***Wine buying tip: All the wines listed above are available at any liquor store in Colorado. If we have access to it, so does anyone purchasing in the state. The rare exception is a wine so hard to get your hands on, it winds up being purchased by restaurants exclusively. Wherever you shop for wine can get these for you. They may ask you to purchase a case if they don’t carry it. If so, don’t be afraid to ask for 10-15% off which is the standard discount on case purchases.